There is a new fire between Yosemite Valley and Mariposa near Midpines. Location: Telegraph Road and Sherlock Road in the Midpines Area. Structures Threatened: Structures threatened in the Midpine Area. Evacuations: Evacuation warnings are in place for residences in the immediate area of the fire. Cooperating Agencies: CAL FIRE, Mariposa County Fire, Mariposa Sheriffs Department, BLM, USFS, CCC, and California Department of Corrections and Rehabilitation. Resources Committed : 1 AirAttack, 4 AirTankers, 3 Helicopters, 20 Engines, 8 Hand Crews and 10 Dozers. 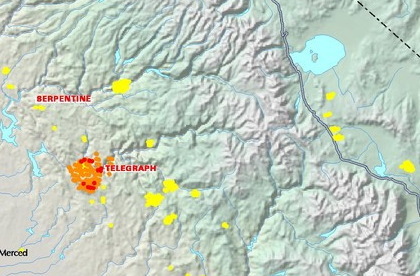 Conditions: The fire is burning in the Merced River Drainage, on both sides of the river. 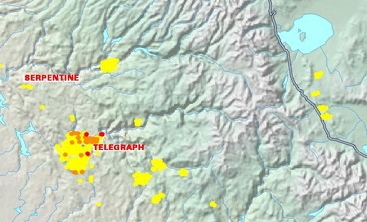 The fire is burning with a moderate to rapid rate of spread. Accessibility problems due to steep, rocky and isolated terrain. It appears to be an especially bad location to have a fire. > It appears to be an especially bad location to have a fire. Yeah, lots of dry grass to burn around there. As of 8:30 PM it has grown to over 16,000 acres. My family and I are arriving in the valley on August 4th (next Monday), spending a few days at Curry and then heading for the Sierra Loop (May Lake, Glen Aulin and Toulumne). We've been waiting for this trip for a year! Might this fire threaten our trip? I'm not very well oriented to how far the fire location really is from the valley, whether we'll end up with a ton of smoke in the valley, etc. It's an extra concern for us as our youngest daughter was born with just one lung and has asthma - so having her breathe smoky air for a week probably isn't an option. > waiting for this trip for a year! > for a week probably isn't an option. I was at Vogelsang last weekend. On sat night the sky was partially cloudy because of the smoke. But stars were still visible. During the ranger star-talk, one could see the particulates shining on the laser beam. Though none of the people who were there complained about breathing. I don't think the fire will be a threat to Yosemite but it could possibly result in Hwy 140 being closed. As for the smoke it's hard to say. We've been dealing with smoke for weeks. It just depends on the winds. I'd say go ahead with your trip and see how it looks when you get to Yosemite. I understand Yosemite Valley was without power last night. Has it been restored yet? > it been restored yet? The webcams haven't update since Saturday afternoon. So I'd say there's a good chance that power is still out. Though Pacific Gas and Electric cut power to the park, onsite generators were supplying energy to keep lodges, stores and visitor service stations open. It just keeps getting bigger. We had heavy smoke from it all day at the lake. Louis... I have family who live on Colorado Rd between 140 and the curve south... where exactly is the fireline??? has it crossed Ranchera Creek Rd? According to the CHP and Mariposa County Sheriff report Colorado Rd. and Ranchera Creek Rd. are closed and evacuations are in effect for that area. Yes, evacuated... just hoping their home isn't burnt. Prayers sent to the area..God bless our firefighters. Thanks for the help... if anything new crops up, please advise. Living in Coachella Valley, so news is trickling down to these parts. 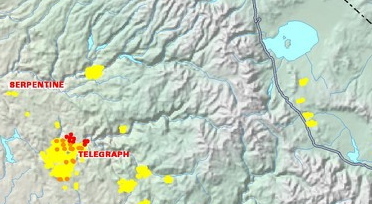 Upon signing out for the day Telegraph Air Attack reported to Telegraph Operations the fire is doing "much better than yesterday". He described how earlier in the day they successfully worked from the south then north. He acknowledged he couldn't see through the smoke to give a final overhead impression of the activity occurring in the east and northeast flanks. Division R is trying to keep the fire from running in to the Rancheria Creek Road and Colorado Road area just west of Midpines. I would appreciate any information. > I would appreciate any information. According to this story, the Aborns are doing fine, and their horses and sheep are safe. "Mariposa County Supervisor Brad Aborn has his own horse story. He and his wife run Flying A Ranch, where they breed prized black Arabians. When the fire threatened, neighbors showed up with horse trailers to help pack out the ranch's three stallions and more than a dozen mares. "It was like the 1800s, when you had barn-raisings," Aborn said. "People pitched in like you can't believe." The horses are being temporarily housed at the county fairgrounds, along with the family's 14 sheep. Aborn and family, meanwhile, bunked down that first night at his office in the county building in Mariposa. His children got sleeping bags. Aborn slept on a blanket. "It's an adventure -- sort of like my survival training in the Navy," he said. "But a little different with a wife, and kids and horses."" I keep looking, and so far no news is good news. If you have Google Earth installed (free download at Google) you can get a good visual update of what's new, old, and the direction it's going by clicking below the large photo where it says "download kmz file". Just (assuming Google Earth is already installed) click on it and choose to run the file. 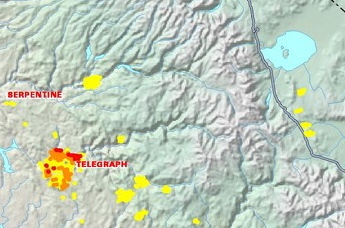 You can zoom in on the Telegraph fire and see what new hotspots are showing for various time periods. This is really a shame to happen now to the Mariposa area; they've suffered through the Ferguson slide and the loss of business for a long time, now they're barely past that, and right in the middle of the summer season, this happens. With all the recent lightning fires, it was surprising to see target shooting listed as the cause. They're listing the cause of this fire as target shooting. Brother at the house with Firefighters. Looks like they are using his home as an outpost/staging area. Sister at shelter. Cell Phone towers blew up and electricity is turned off, so no phones working in the area. All major roads to area hard closed. and looks like CHP closing 140 between Mariposa and El Portal. Anyone visiting Yosemite call ahead to see if Park will remain open. 140 entry closed. Electricity off, working on generators. Think 41 entry still open? Thanks to all for continuing posting info. We and our families appreciate it. UPDATE: YOSEMITE PARK REMAINS OPEN...PER THEIR WEBSITE. > Think 41 entry still open? Both 41 and 120 are open. It's good to hear your family is safe. Thanks for the info. Well, no news yet from our family up there in Midpines other than that they were evacuated. No news is good news. Because we have been pinging E-mails from the Evac center. Oh, we just had a 5.8 earthquake here in So CA.! Isn't California just fun? Broke a couple of dishes here. Nice ride. 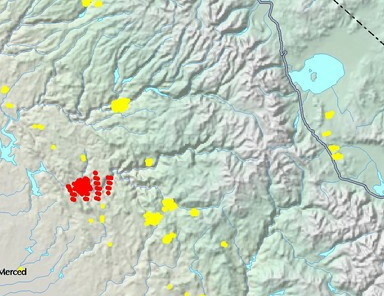 Fires...earthquakes...never a dull moment, eh? The wind is out of the north here on the south shore of Tahoe and a little cooler. The Firefighter Blog is operated by a retired fireman and he is posting reliable information and a good variety of maps. YOSEMITE NATIONAL PARK, Calif. (AP) - The main western highway into Yosemite National Park is reopening after firefighters pushed back flames that have charred about 50 square miles just outside the park. Authorities had temporarily shut down a 10-mile stretch of Highway 140 to keep flames from leaping across the Merced River canyon earlier this week. The road reopened this morning, but officials are still recommending tourists take alternate routes into Yosemite to give fire engines enough room to maneuver. The blaze raging since Friday has destroyed 21 homes and is only 20% contained. Fire officials previously said 25 homes burnt down, but revised their assessment today after discovering 4 of the structures were outbuildings. CalFire is now report 40% containment. As of 12 p.m. the following roads are in the evacuation area: Texas Hill Rd., Dogtown Rd from Texas Hill Rd to Schilling Rd., Schilling Rd to Hwy 49N, Michaeloaks Rd. with road closure beginning at Hwy 49N. They have 65 Bulldozers on this fire, that's impressive. They have a lot of resources in California right now from all the fires that are winding down so they have a lot to throw at this one. Here's the stats as of today. fyi... had an E-mail from my relatives. They are safe and their home is too. Thanks for the updates. And I will continue to monitor it. > their home is too. Very good. Glad to here it. •Re-entry into the evacuated areas that are unaffected by the Telegraph Fire Northwest of Hwy 49 North. •Areas to include Mount Bullion Access Road from Highway 49 North to the CDC Camp. •Mykleoaks from Highway 49 North to and including Bear Trap Road. •Fournier Road and French Camp Road. 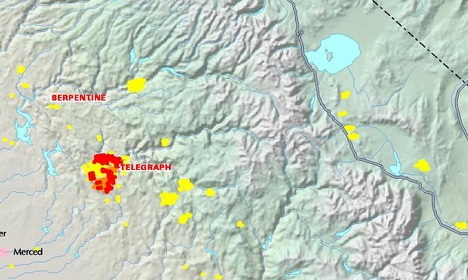 •Re-Entry into the evacuated areas that are unaffected by the Telegraph Fire that are located West of Highway 140. •Areas to include Grosjean, Avoca Vale, Serpentine and Lake View. •East Whitlock closing at Colorado Road. Oak Road, Yosemite Oak, Crystal Aire including all spur roads. •Colorado Road to Rancheria Creek Road. •Rancheria Creek Road will remain closed at this time. All of the above recommendations will be modified based on fire behavior and movement. Residents will be required to show identification of residency in order to re-enter which can include a valid driver’s license or utility bill. Residents are cautioned to drive slowly as fire vehicles are still working in the area. Cal Fire reports containment at 45%. thanks to everyone for keeping the fire news up to date. CalFire's 7 am report said the fire is 60% contained. The 7 AM CAL FIRE update says the fire is now 80% contained. The noon CalFire update shows 90% contained. As of noon CalFire report 95% containment and full containment is expected on Monday. They still report 95% containment and have changed the full containment date to August 5. CalFire is still report 95% containment. They have pushed their full containment to August 6th. That final 5% must be in an especially tough spot to deal with. > final 5% must be in an especially tough spot to deal with. Or "full containment" means a drop in funding. They are now reporting 100% containment.